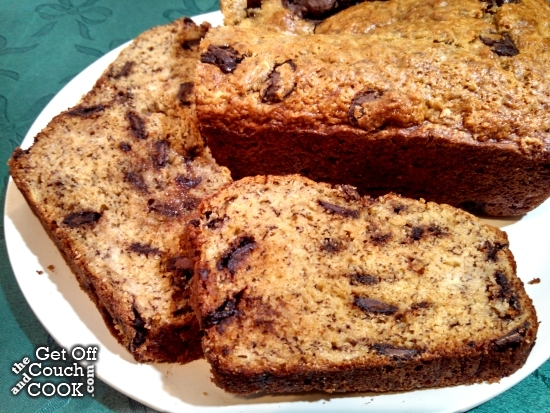 Olive oil and lemon zest plus dark chocolate add an amazing richness to ordinary banana bread. This month I was assigned Little Bit of Everything, a blog run by Julie who has been blogging for the past 6 years from Nebraska. I almost made her slow cooker French Onion soup but decided that wouldn’t be a very nice thing to do to Mr. Onion-hater whose allergy to onions is so bad that the very smell is a bad thing for him. So I looked at Julie’s Butter Dips and Cinnamon Swirl Banana Chocolate Bread but ultimately decided on making her Lemon Olive Oil Banana Bread. 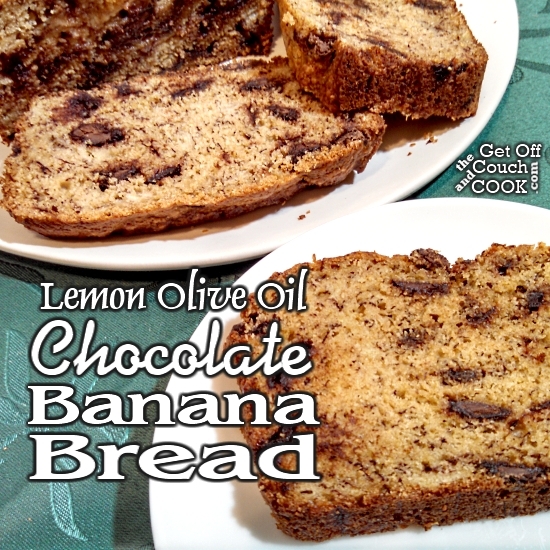 Admittedly, I was little skeptical of using lemon zest and olive oil in conjunction with banana and chocolate but intrigued enough that I had to try it… just like Julie was when she tried it. Of course, I made a couple of minor tweaks. The main one being the lack of glaze over the top. I’m sure it was delicious but a cup of sugars just sounded too sweet to me and, after tasting the bread without it, I think I made the right choice. I also used sour cream in place of plain yogurt because that’s what I had on hand and I added a bit more chocolate because… well… chocolate. Mr. O and I ate half the loaf ourselves the day I made it. Ms. W came over after work the next day and also made many yummy sounds while eating a couple slices before dinner. The lemon zest adds a very subtle back-end flavor that most people wouldn’t realize is lemon unless told and the olive oil adds a richness that was delightfully surprising. This bread was SO moist but didn’t fall apart like some banana breads do. 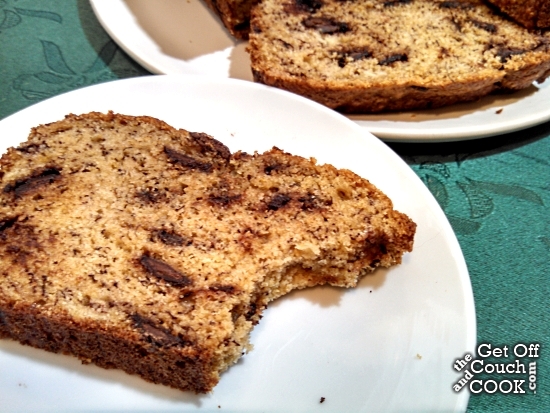 I think this is going to be my usual banana bread recipe, with or without the chocolate pieces. I’m thinking it would be amazing with chopped walnuts, too. Preheat oven to 350°. Lightly coat 9″x5″ loaf pan with nonstick cooking spray. Set aside. In a large bowl, stir together both flours, the brown sugar, baking soda and salt. Gently stir in the chocolate pieces. In a medium bowl, lightly beat the eggs. Stir in the olive oil, bananas, sour cream, lemon zest and vanilla until blended. Pour the banana mixture into the flour mixture and stir until just combined and wet. Do not over mix. Scrape the batter into the prepared pan and bake until golden brown and just set, 40-50 minutes. Try to not over bake or the bread may come out dry. Transfer the pan to a wire rack to cook for 10-15 minutes then turn the loaf out fo the pan to cool completely. 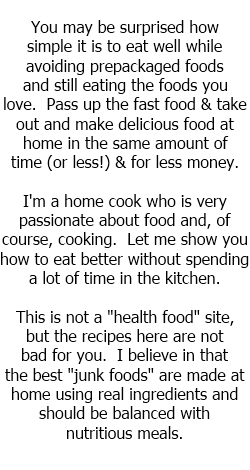 Glad you liked the recipe. It is a unique combination of flavors! Love a good banana bread recipe and I like this is unique and different than most recipes. Great SRC choice! I have only baked once with olive oil and I must say it was delicious. I have to do it more often. Paired with the lemon and chocolate..mmmm so good! I’m not skeptical about this at all. I am sure it is so good! Great SRC post. I have some lemon olive oil in the pantry. Wonder if that would work? This sure does look tasty.